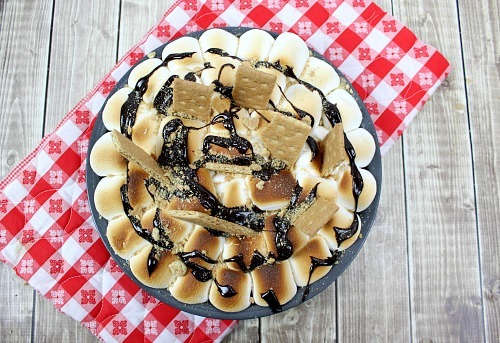 Nothing says summer like s’mores! But you don’t have to deal with the heat and the bugs to enjoy some delicious s’more flavor. Instead, why not just make s’mores out of a family favorite- fresh baked brownies! 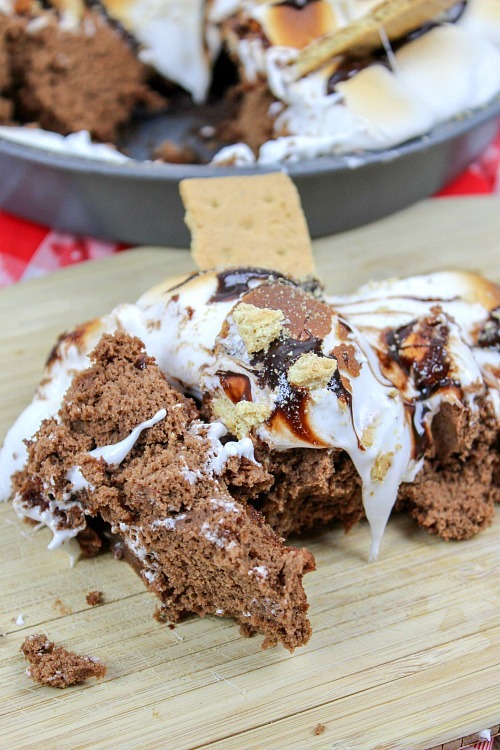 This semi-homemade dessert is quick and easy to put together, and full of gooey, chocolatey s’mores flavor! 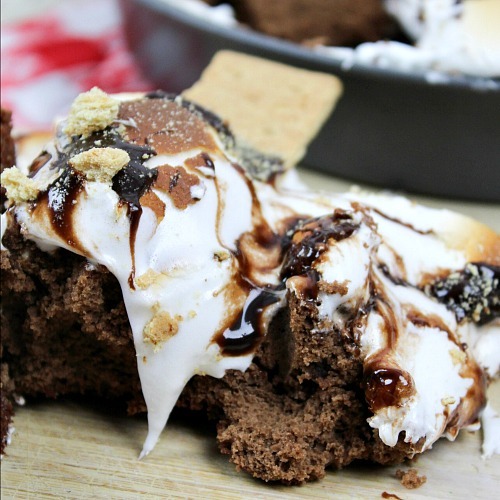 Here’s how I made this delicious S’mores Brownie Bake! 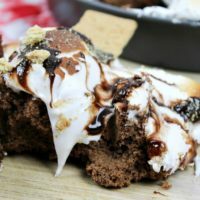 With only a couple of ingredients and quick prep/cook time, this s’mores brownie bake dessert is perfect for busy days. Plus it makes a lot, so it’s great for serving a lot of people! We’re not so into traditional camping in my house (there are too many bugs in the woods for me and the kids), but we do like to do a kind of faux camping. At best we pitch a tent in the backyard. If it’s too buggy, we’ll just lay out sleeping bags in the living room by the sliding glass door (so we can see nature, but not be in it). 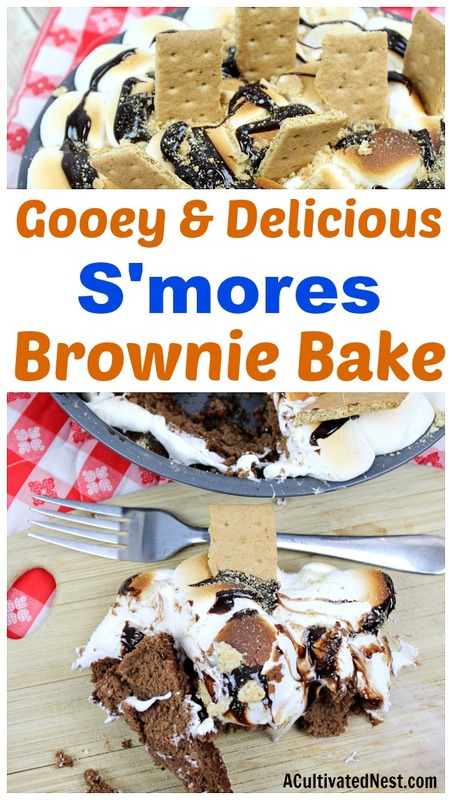 This s’mores brownie bake has become the kids’ favorite treat for our little “camping” evenings because it’s so gooey and delicious. And I like it because it’s quick to mix up! 2. 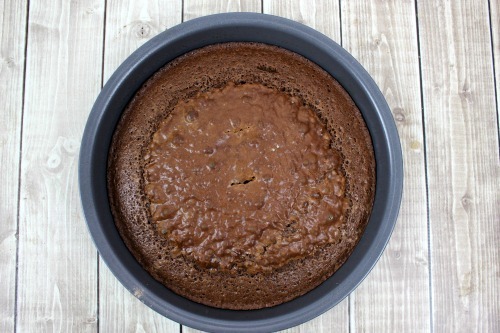 Spray a round cake pan with cooking spray. 3. 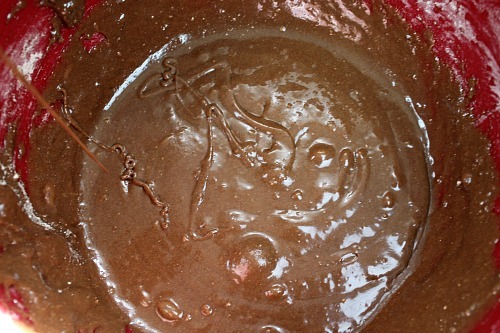 Prepare brownie batter according to directions. 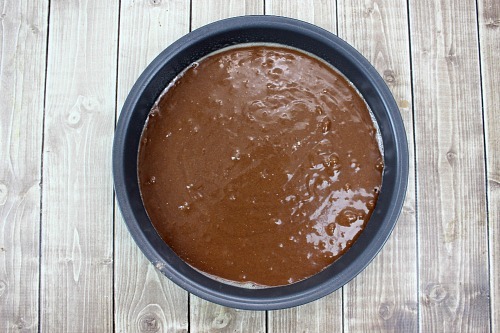 Pour into cake pan. 4. Bake for 20 minutes. Stick a knife in the center to ensure the brownies are done (some moist flakes on the knife are fine, you just don’t want soft batter). 5. Pour hot fudge sauce into a microwaveable measuring cup. Microwave at 60 percent power for 1 minute. Stir. Microwave at 60 percent power for 1 more minute. Stir. If not hot enough, microwave further, but don’t overheat (you want it hot, but don’t want it to burn). Set aside, covered with a towel or scrap piece of foil to contain the heat (it’ll be easiest to pour if still warm). 6. 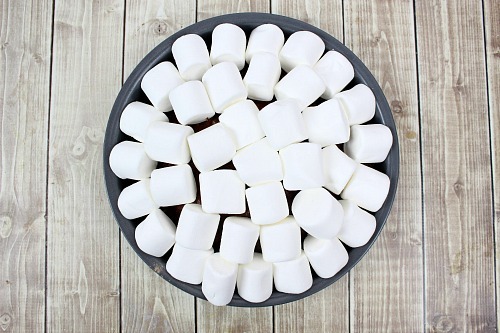 Place large marshmallows on top of the brownies. 7. Broil for 2 minutes – make sure to keep an eye on it so it doesn’t burn! Take out of the oven. 8. 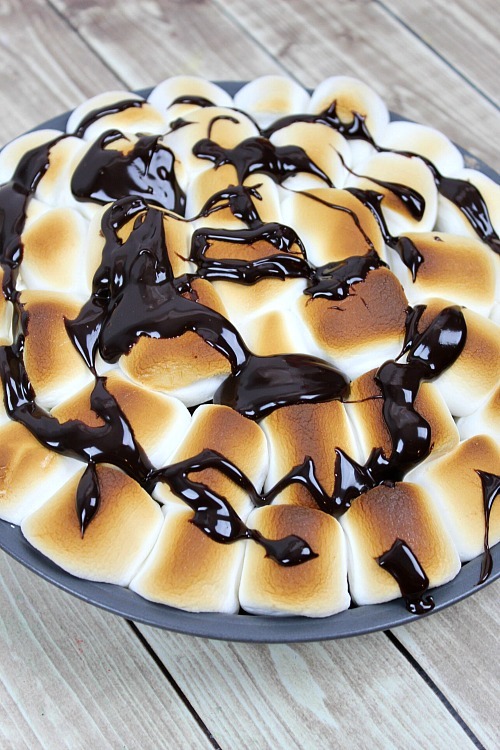 Drizzle the warm fudge sauce over the marshmallows. 8. 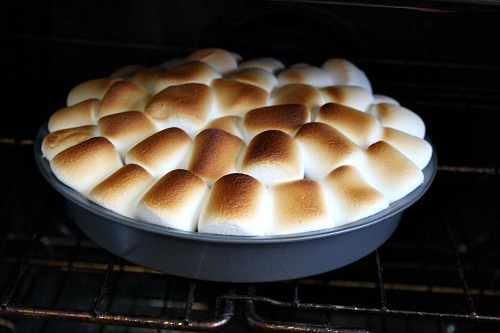 Stick a few graham crackers into the marshmallows. Also, crush some graham crackers and sprinkle on top. 9. Serve right away and enjoy! Do you like traditional s’mores? You don’t have to deal with bugs and heat to enjoy some s’mores! 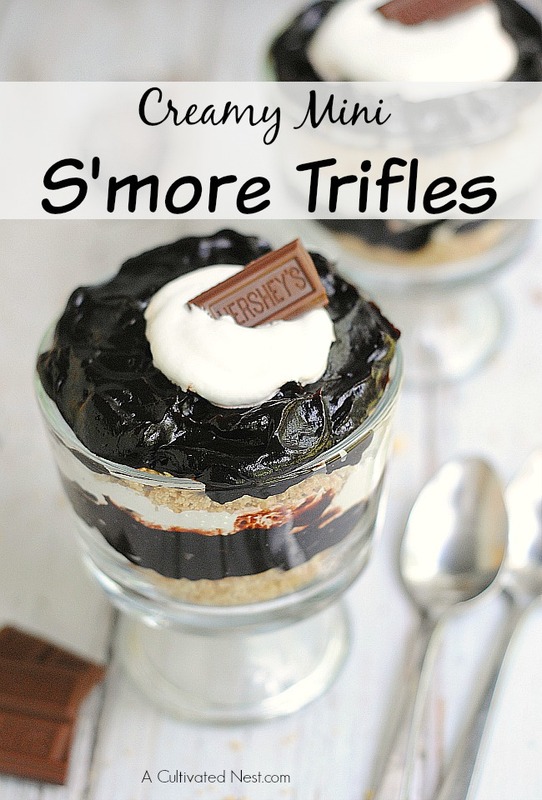 This easy semi-homemade dessert is full of s’mores flavor, but is quick and easy to make at home in the oven! 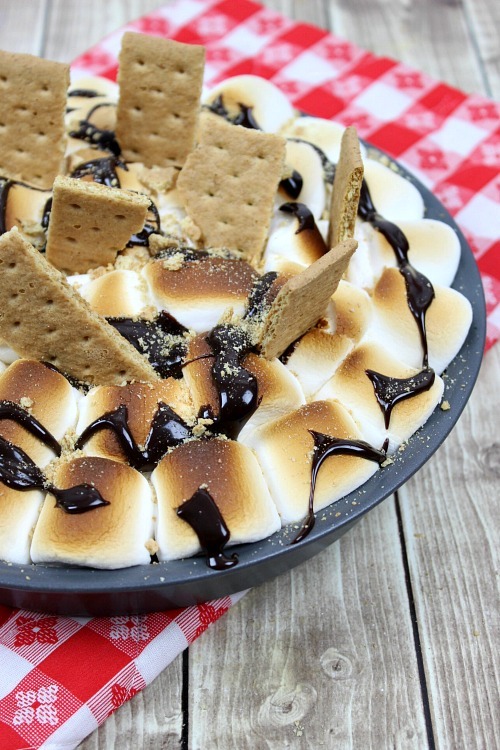 Gooey and so delicious, you’re going to love this s’mores brownie bake!